In 2013, Chris Pratt dropped the “I got in shape” selfie heard ’round the world. As lovable idiot Andy Dwyer on Parks and Rec, Pratt’s weight had ballooned to 292 lbs. That’s quite hefty, even for a 6’2″ frame, but it fit his character. He mainly bounced around the walls of the show wearing Colts jerseys, eating taco meat out of frisbees and moonlighting as an FBI special agent named Burt Tyrannosaurus Macklin. But in 2012, he began training for his role as Star-Lord in Marvel’s Guardians of the Galaxy, which hit theaters August of 2014. Seemingly overnight, the floppy-haired, barrel-chested manchild turned himself into a legitimate superhero. In Parks and Rec Season 5, Andy explains his new body by saying all he did was quit drinking beer. Pratt’s transformation is one of the most well-known stories of a Hollywood actor starting from scratch and molding him/herself into a bona fide specimen. It’s become a consistent trend, though, and one sure to continue as Marvel and DC Comics mine their archives into perpetuity. The latest example is Brie Larson, a once self-proclaimed “klutz” who looks nothing but in Captain Marvel, and in the several training videos she’s posted on Instagram. In order to better how understand how these stars (who, believe it or not, have trouble getting out of bed and working out just like the rest of us) got so yoked, we decided to take a look at seven fitness regimens from recent superhero films. Some through lines? The importance of building a foundation: walk before you run, or push-up once before you do push-ups with 50-lb. chains on your back. There’s also an across-the-board emphasis on functional movements, fighting techniques like boxing or Muay Thai and admirable nutrition standards. And … pull-ups. So. Many. Pull-ups. Still, the most prevalent through line here is one you can’t replicate, and that’s time. These actors and actresses could make becoming a superhero their full-time job, because doing so truly was their full-time job. That shouldn’t make these workouts seem unattainable, though. View them as coursework to help you patch together your own workout, and don’t beat yourself up if you only get to the gym four times a week while Hemsworth and Gadot rip two-a-days. Whatever gets you off the couch and feeling good is a win. The skinny: Daily training: soft-tissue work in the morning, followed by a big lift focusing on squats, push-ups and pull-ups. Focus on fight choreography and adjustments in exercise form in the afternoon. The surprising: Push-ups with chains! Once Larson mastered conventional push-ups, her trainer had her add weight, which forced her core to remain tight during each rep. She started wearing up to 50 lbs. of chains during a set. Get the full workout here. The skinny: Five months comprised mostly of circuits, and each month with a different focus: bodybuilding for two, bodybuilding and conditioning for two, just conditioning for the last month. Pratt bulked up only to purposely lean down at the end, giving him that shredded look. The surprising: The approachability of his circuits. Nothing on Pratt’s routine would be too foreign to anyone who’s visited a gym before. Think an assortment of squats, push-ups, pull-ups and rows. The skinny: Six days a week of training, never more than a one-hour session at a time. Tire hammer slams, heavy emphasis on the triceps (quickest way to make your arms look bigger), Arnold press, pull-ups, etc. The surprising: Hemsworth got too big for the first installment of Thor. Roll your eyes, sure, but they had to adjust to the demands of the role by instituting more movement-based routines. Think Muay Thai, boxing drills, Cross-Fit-esque circuits. Being an athlete outside of the gym doesn’t hurt either. Hemsworth’s a dedicated surfer. The skinny: Many sets at high reps to achieve an agile, cut physique. An emphasis on pull-ups, jump squats, cleans and running. Bale is an avid runner. The surprising: The rare bench-press machine was put to use here. The Smith machine bench press is a method by which you explode up, letting the bar leave your hands, then catch it on the way down. 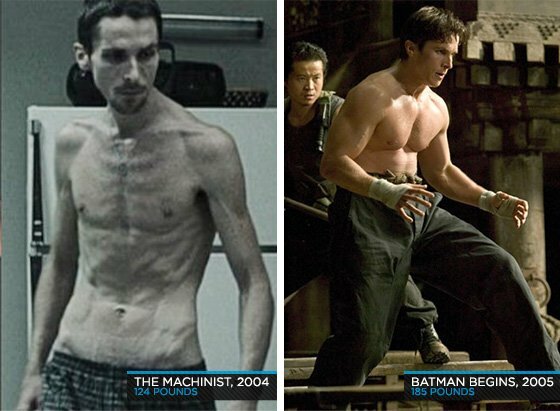 This develops white muscle fibers and helps build muscle quickly (which Christian Bale has had to do once or twice). The skinny: Circuit exercises that that eviscerate the whole body, with a massive focus on mobility. Think: time on the rowing machine, bear crawls, burpees, crab walks and ring pushups. The surprising: When she started, Gal Gadot could not do a single pull-up. Eventually, she was doing seven sets at three reps each with one minute of rest in between. Wonder Woman, indeed. The skinny: Two workouts: one that emphasizes the chest, another that emphasizes the legs. For the chest: five rounds of bench press (how else do you think he got those pecs?) along with push-ups and cable crossovers. For the legs: sled pushes, squats, walking lunges. Any turfed stretch of space works perfectly there. The surprising: Momoa is an accomplished climber (even climbing recently with Alex Honnold) and used the sport to complement his bodybuilding. Introducing different exercise methods outside of the gym can “shock” the body and stave off risk of plateauing, which is all too common in heavy weightlifting. The skinny: Alternating two days: one for chest and arms, the other for shoulders and triceps. Before the bodybuilding work, Boseman had to run one mile at 10 MPH, climb stairs for 10 minutes and punch the bag for 20 minutes. The surprising: A tie: A) the goal was to make Boseman look like an NFL wide receiver by filling up his long arms with definition. And B) to prepare for all the fight scenes, trainers leveraged Boseman’s background in martial arts, and had him practice jiu-jitsu.